JBJ introduces the all new GLASS PICOTOPE! This stunning 3 gallon curved glass desktop is an excellent starter tank that offers rounded glass corners for panoramic viewing, a beveled glass bottom, a 9 Watt 50/50 clamp-on Lamp, and the original Pico Powerfilter. The PICOTOPE is sure to add a touch of class and style to any room it graces. Ideal use for a small aka pico freshwater or saltwater tank. 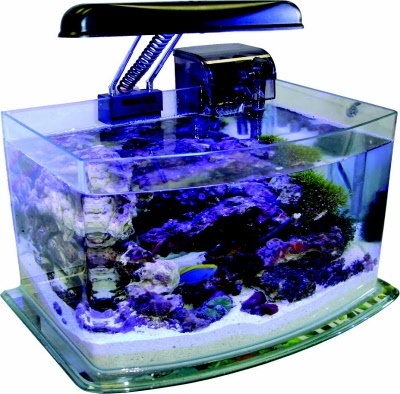 Fish and corals will love this mini aquarium. Includes: 3 gallon glass aquarium, 11-3/4" x 8-7/8" x 8" tank; compact fluorescent Clamp-on Lamp fixture with 9W 50/50 lamp and remote ballast; 40 gph Pico powerfilter. Our unique Clamp on Lamp fixture hangs on the back wall and can be positioned UP, DOWN, and even FORWARD to find that perfect illumi-nation spot to view your favorite live animal. This energy saving JBJ Compact Fluorescent fixture contains a 9 watt 50/50 lamp with a re-mote ballast for a cooler running pico environment. 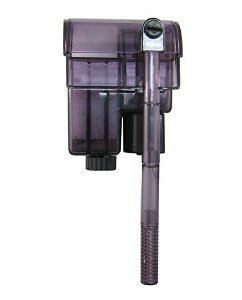 The PICO Powerfilter is a revolutionary innova-tion that offers the same 3 stage filtration com-monly designed for larger filters in a space-saving hang-on design. 1. Mechanical Filtration Black filter sponge traps free floating particulate matter and debris. 2. Chemical FiltrationActivated Carbon Bag removes dissolved organics and odor. 3. Biological Filtration White sponge offers maximum surface area to colonize beneficial bacteria to remove harmful toxins. 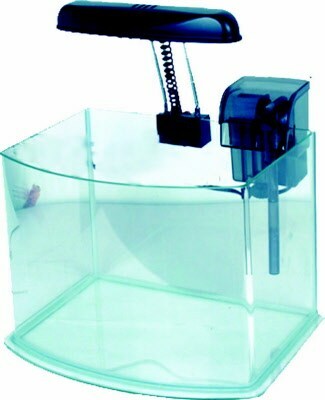 The PICOTOPE starter aquarium offers panoramic viewing with smoothrounded corners for maximum viewing and enjoyment. Note: Always fill PICO Powerfilter with water before plugging into an approved 115V outlet. Pump may need 30 seconds to 1 minute to prime and start filtering. If pump does notstart, add more water into rear of filter with a cup. Never attempt to move a full or partially full PICOTOPE. Never lift by grabbing the aquarium walls. Never use cleaners that contain ammonia to clean the glass surfaces. Always lift and carry the PICOTOPE from underneath giving support tothe bottom at all times. Find a leveled surface that can support the weight of the tank, water, and livestock. An average aquarium can weigh 10lbs per gallon once filled with water, rock, gravel, and other accessories. Do not place in direct sunlight to prevent excessive algae growth and higher water temperatures. Always dechlorinate tap water before adding into the aquarium. Always fill with room temperature water. Rinse Activated Carbon which is located in the rear filter compartmentunder the sink for 30 seconds or until water runs clear. Fill the main body of the PICOTOPE until water reaches the bottom of the clamp for the light fixture. Once PICOTOPE is filled, plug PICO pow-erfilter power cord into an approved electrical outlet with a fuse or cir-cuit breaker. Once filter is on, water will enter intake strainer through the filtrationmedia and return back into the tank. If you wish to keep tropical (warm water) fish you will need a submersible heater to maintain optimal water temperatures to simulate their natural environment. Most tropical fish will need a temperature rangebetween 74-78 F for optimal living conditions. 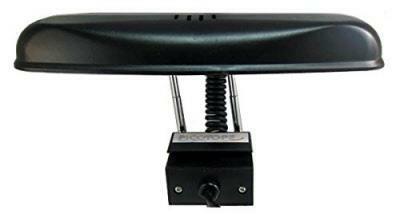 A heater can be placed in the main body of the PICOTOPE behind accessories such as decorations, plants, or rocks. We recommend a small 100% submersible 25-50 watt heater if neces-sary. Note: Evaporation occurs faster in smaller tanks that have open tops. Please check water level regularly to ensure filter is functioning properly. Your PICOTOPE has an innovative set of telescoping arms that can be extended and retracted to meet your specific lighting needs. The telescoping arms can be adjusted 180 degrees from front to back. Please careful not to handle the fixture during operation. Light fixture may be warm to hot and should not be adjusted until time has been allowed to properly cool down. Never allow water contact on any part of the Clamp on Lamp. Never service the light fixture while fixture is plugged into an electrical socket. Your PICOTOPE is pre-installed with a dual color lamp that offers day-light and blue actinic light in one compact design. 1. Plug power-cord from the remote ballast into an outlet strip that is properly approved and equipped with a fuse or circuit breaker. 2. Press the switch located on clamp portion of the light fixture to “ON” position to turn on compact fluorescent lamp. * We recommend you keep a photoperiod of 8-10 hours per day to replicate a natural cycle that your livestock has grown accustomed to. Regular maintenance is the key to a successful thriving aquarium. Maintaining an aquarium can be very easy with a regular cleaning sched-ule. A. Water changes should be carried out on monthly to bi-monthly schedule depending on how much bio-load is kept. B. 25% water changes with gravel vacuuming is essential to keep dissolved organic carbons to a minimum. A. Filter Sponge should be changed on a monthly basis to remove trapped debris and free floating particulate matter. A. Activated Carbon adsorbs dissolved pollutants and removes the yellow discoloration of water and associated odors. B. Replace Activated Carbon Bag on a monthly basis. A. Biological sponge should not be removed as it houses the beneficial nitrifying bacteria for removal of ammonia and nitrite. B. This sponge does not need to be changed. Pico Filter should always be unplugged before changing media. Remove filter top cover and change media.Always remember to fill up Pico Filter with water before plug-ging back into an electrical wall outlet. Your PICOTOPE is installed with the following: We recommend replacing lamps every 9-12 months due to a decline in intensity which is vital for corals and invertebrates. Spectral shiftsmay also occur that may lead to undesirable algae growth. 1. Unclamp the light fixture from the tank rim. 2. Lay light fixture down on a leveled surface and unscrew light cover. 3. Unclip lamp from bulb clips. 4. Unplug the (2) female wires from the male pins at the base of the lamp. 5. Re-insert new replacement lamp and reconnect wires, place into bulb clips, and screw on light cover. If the aquarium appliance falls into water, DON'T reach for it! First, unplug it and then retrieve it. If the electrical components of the appliance get wet, unplug the appliance immediately. Carefully examine the appliance after installation. It should not be plugged in if there is water on parts not intended to be wet. Do not operate any appliance if it has a damaged cord or plug, or if it is malfunctioning, or if it is dropped or damaged in any manner. To avoid the possibility of the appliance plug or receptacle getting wet, position the aquarium stand and tank to one side of a wall mounted receptacle to prevent water from dripping onto the receptacle or plug. A "drip loop," should be arranged by the user for each cord connecting an aquarium appliance to a receptacle. The "drip loop" is that part of the cord below the level of the receptacle or the connector if an extension cord is used, to prevent water travel along the cord and coming in contact with the receptacle. If the plug or receptacle does get wet, DON'T unplug the cord. Disconnect the fuse to the circuit breaker that supplies power to the appliance. Then, unplug and examine for the presence of water in receptacle. To avoid injury, do not touch moving parts or hot parts such as heaters, reflectors, lamp bulbs, etc. Always unplug an appliance from the outlet when not in use, before putting on or taking off parts, and before cleaning. Do not use an appliance for other than intended use. The use of attachments not recommended or sold by the appliance manufacturer may cause an unsafe condition. Do not install or store the appliance where it will be exposed to the weather or to temperatures below freezing. Make sure an appliance mounted on a tank is securely installed before operating it. This appliance has a polarized plug (one blade is wider than the other). As a safety feature, this plug will fit in a polarized outlet only one way. Never use with an extension cord unless plug can be fully inserted into outlet. This appliance is intended FOR HOUSEHOLD USE ONLY. Do not use or mount this appliance in such a way that the top vents are restricted or blocked. These vents are necessary to avoid overheating and ensure safe operating temperature. Make sure the appliance is set on a level surface to prevent undue stress on the tank. It is important to keep this appliance clean. Always unplug the appliance before performing maintenance or cleaning the exterior of hood. Wipe exposed surfaces carefully with a damp terry cloth to remove any dust or mineral deposits, which may collect over time. Make sure all surfaces are dry before re-plugging into an electrical outlet. To prevent scratching the aquarium, use a damp terrycloth when cleaning. Never use algae scrapers, scouring pads, razor blades, glass cleaner, or other such abrasives. In order to ensure proper electrical connections and polarity, a qualified electrician should replace parts and perform servicing. Please carefully read the entire owner's manual for proper operation procedures before proceeding with turning on this appliance and adding livestock such as fish, coral, and invertebrates. Never attempt to move a full or partially full Picotope. Never lift by grabbing the walls. Never use cleaners that contain ammonia. Always lift and carry from underneath, giving support to the bottom at all times. Find a leveled surface that can support the weight of the tank, water, and livestock. An average aquarium can weigh 10 lbs per gallon once filled with water, rock, gravel, and other accessories. To prevent excessive algae growth and higher water temperatures, do not place in direct sunlight. Always de-chlorinate tap water before adding to aquarium. Rinse Activated Carbon, which is located in the rear filter compartment, for 30 seconds or until water runs clear. Fill the main body until water reaches the bottom of the clamp for the light fixture. Once it's filled, plug powerfilter into an approved electrical outlet with a fuse or circuit breaker. Once filter is on, water will enter intake strainer through the filtration media and return back into the tank. If you wish to keep tropical (warm water) fish, you will need a submersible heater. Most tropical fish will need a temperature between 74-78°F for optimal living conditions. A heater can be placed in the main body behind accessories such as decorations, plants, etc. The manufacturer recommends a small 100% submersible 25-50W heater if necessary. Plug power-cord from the remote ballast into an outlet strip that's properly approved and equipped with a fuse or circuit breaker. Press the switch located on the clamp portion of the light fixture to "ON" position to turn on compact fluorescent lamp. *It is recommended you keep a photoperiod of 8-10 hours per day to replicate a natural cycle that your livestock has grown accustomed to. Water changes should be done on a monthly to bi-monthly basis, depending on the bio-load kept. 25% water changes with gravel vacuuming is essential to keep dissolved organic compounds to a minimum. Should be changed monthly to remove trapped debris and free-floating particulate matter. Activated Carbon adsorbs dissolved pollutants and removes the yellow discoloration of water and associated odors. Replace Activated Carbon bag monthly. Should not be removed as it houses the beneficial nitrifying bacteria for removal of ammonia and nitrate. This sponge does not need to be changed. Always disconnect the power supply when performing lamp changes. The manufacturer recommends replacing lamps every 9-12 months, due to a decline in intensity, which is vital for corals and invertebrates. Spectral shifts may also occur that may lead to undesirable algae growth. Unclamp light fixture from tank rim. Lay light fixture down on a leveled surface and unscrew light cover. Unclip lamp from bulb clips. Unplug the (2) female wires from the male pins at the base of the lamp. Re-insert new replacement lamp and reconnect wires, place into bulb clips, and screw on light cover.